Politicians manipulate the facts to suit their political needs. It is the job of the press to sort competing claims to the truth and thus inform the public. Alas, they do a lousy job. This poor performance, bias aside, is largely due to their inability to ask the right questions and their poor analytical skills. A major in one of the hard sciences should be a requisite for a career in journalism. Instead when in college the future journalist approaches science, mathematics, and statistics with the same dread former Mayor Bloomberg has for a 32 ounce smoothie. Consider two topics now in the public arena – income inequality and congress’s approval rating. Both of these issues are approached incorrectly. Start with income inequality. Income inequality by itself is meaningless. If you have enough money (define enough yourself) what difference does it make to you if someone else has a lot more? If this makes you unhappy you’re a casualty of envy. What matters is income mobility. Do you have the same chance to increase your income as you go from youth to maturity as did previous generations? This is the critical statistic. The short answer is yes. This question rarely gets asked and when it does it’s answer seems to surprise. Just a few days ago the PBS Newshour interviewed Harvard professor of economics Raj Chetty. RAJ CHETTY: No matter which way we define upward mobility, the main finding of our most recent study is that your odds of climbing up the income ladder haven’t changed significantly over the past three decades or so. JEFFREY BROWN: So were you surprised by that finding? This is a full professor of economics who’s surprised by a finding that the US Department of the Treasury reported on in 2005, ie income mobility has not changed. I wrote about it here two years ago. Chetty’s report is below. The world being the way it is, we are going to hear a lot more about income inequality than we are about income mobility. Even though, or maybe because, the latter is far more important than the former. Now for congress’s approval rating. It’s terrible and also meaningless. If we disapprove of congress so much why do we keep reelecting the same miscreants? There are 435 congressmen and 100 senators. The right question is, What do you think of your congressman? 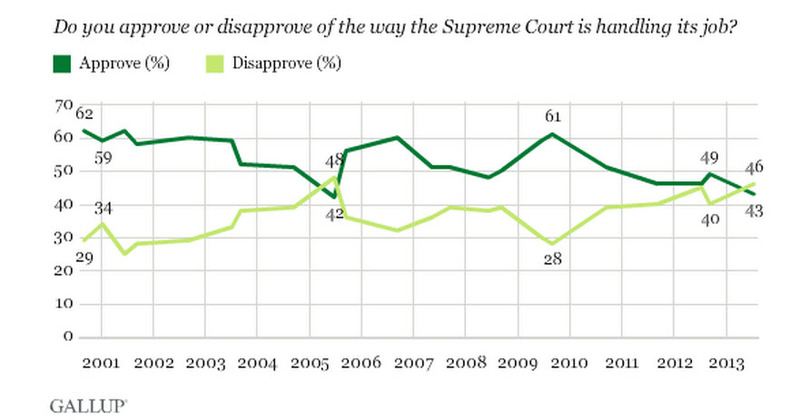 Gallup asks that question. – it’s at the bottom of page 1 at the Gallup site. The pertinent data are below. As you can see approval of a single congressman by his constituency has been falling since 1977. As of Oct 2013 44% approve and 43% disapprove. 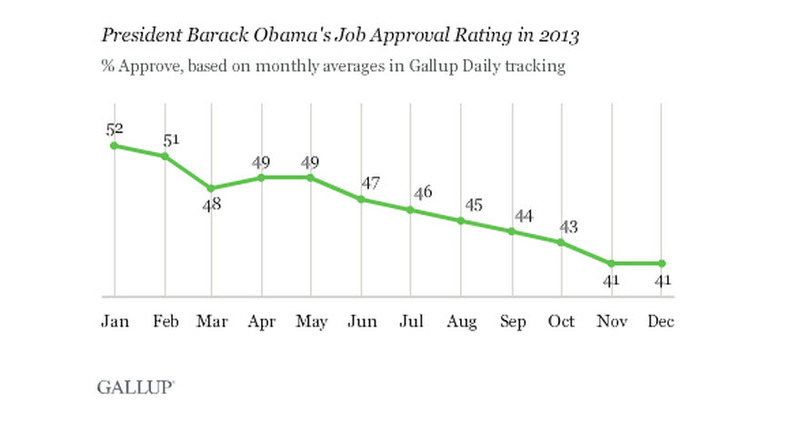 Compare the above depiction of congressional approval with that of the president in Oct of 2013. As you can see his was 43% – one point lower than congress. When you compare the approval of the entire congress (about 10%) to the president’s it’s the ultimate apples to oranges comparison. There’s only one president, but 535 legislators. The only meaningful question is what do you think of your congressman which you can then compare to what you think of the president. Obviously, the public thinks more of their congressman than of the rest of the legislators. This disparity of opinion also suggests the public is confused – not a good condition for a republic confronted with a mountain of serious problems. There are three branches to the federal government. So how is the Supreme Court doing? Its approval rate is 43%. Thus it is obvious that the entire federal government is in bad odor with the public which has essentially the same opinion of all three branches. The approval rates depicted above should come as no surprise, yet the press never seems to ask the right questions about them and accordingly the real state of affairs surprises everyone on those rare occasions when the right question is paired with the right answer.